Thank you for considering me for your wedding officiant. Please take a moment to read this before contacting me to schedule your complimentary consultation. What makes your services unique? Aren't all wedding ceremonies the same? I don't believe that "one size fits all." Each couple receives a ceremony that I create especially for them. While the basic framework of the ceremony is the same, every ceremony is different in some way...crafted to reflect the "amazing love" of the couple. It may include the couples "love story," special ceremonies such as blending of sands, handfasting, shell ceremony, blending families, poems, prayers or blessings chosen specifically for the couple. Additionally, wedding ceremonies are all that I do. I don't plan weddings, I don't arrange flowers, I don't bake cakes...I create wedding ceremonies. That means that your wedding ceremony will have my full attention. Creating a unique, personalized wedding ceremony for you is my only focus. A customized ceremony sounds expensive. Can I afford it on my budget? I know that many of my couples are in the military, and don't have the budget for a huge wedding. I don't believe that this should prevent anyone from having a beautiful and meaningful wedding ceremony. Yes, you can go to the courthouse and get married cheaper, but will it be something that you will look back on and cherish for the rest of your life? Even if you plan on a "real wedding" at some future date, I believe that you deserve more than a court house ceremony now. My goal is to give every couple who comes to me a ceremony that they will be able to remember...when tested by time, distance and deployments...and say, "We had a beautiful wedding ceremony." With three packages to choose from, you can choose the ceremony that will best fit both your needs and your budget. What do I get? With either the Dreams Do Come True or the Intimate Gathering packages, you will receive a keepsake marriage certificate and a copy of your marriage ceremony in a special booklet. Additionally, I usually take pictures following the wedding ceremony; I post these pictures to a special Shutterfly account where you can choose to download, order copies or share them with family and friends who could not attend your ceremony. What kind of a ceremony can I have and how many guests can be there? Package number one is the Dreams Do Come True package. This includes a customized ceremony with any special ceremonies that you may want. This ceremony may be performed in the setting of your choice, with as many guests as you wish. Package number two is the Intimate Gathering and includes a customized ceremony without any special ceremonies. This ceremony may be performed in the setting of your choice, with up to fifteen (15) guests. Special ceremonies may be added for an extra charge. Package number three is The Elopement. This is a basic ceremony with two (2) witnesses. A special Evening Elopement package is also available Monday through Thursday evenings at select locations. Will you do a ceremony on the beach? I perform ceremonies on the beaches from Carolina Beach to Atlantic Beach and everywhere in between. I also perform ceremonies in parks, restaurants, historical buildings, your own backyard or other venue of your choice. What about permits? 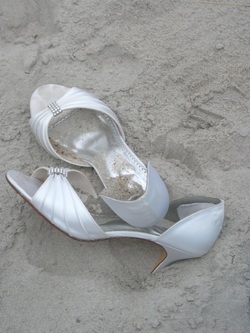 Most area beaches do not require permits; wedding ceremonies are on a "first come, first served" basis. It is good, however, to check with the city/town where you wish to have your ceremony to see if they do require permits. It is your responsibility to obtain any required permits. What if it rains and the wedding is outside? Having a backup plan is always a good idea. However, if there is no backup plan and it is possible to either delay or advance the time of the wedding, I am willing to do so. I'm also willing to do ceremonies in the rain. We'll put up umbrellas, and dance in the rain after the ceremony! What about the marriage license? Do we get that or do you? You are responsible for getting the marriage license from the appropriate Register of Deeds in your county. The fee for the license is $60. Following the ceremony, I will submit the completed marriage license to the Register of Deeds. I am required by law to do this within ten days of the ceremony, or face a $200 fine. It is my practice to submit the license via mail the first business day following the ceremony. You will need to obtain a certified copy of the marriage license from the Register of Deeds to change your name with Social Security and for proof of marriage for insurance and other legalities. There is a $10 fee for each certified copy. Contact the Register of Deeds in your county for more information on how to obtain this certified copy. Do you take credit cards? I take PayPal, cash, and checks. Payment on day of wedding MUST be made in cash. If you are planning your wedding months in advance, a payment schedule may be arranged. Who are you? I am a hopeless romantic who believes that everyone should have a wedding ceremony that they will always remember. I believe that the vows that you make to each other are very special, and that they should reflect you...your love, your beliefs, your traditions. If you want a "traditional" ceremony, you should have that. However, if you aren't "traditional" and want a ceremony that is uniquely you, that's the ceremony that you should have. To learn more about me and my story go to "A little bit about Paula." What are your qualifications? I am a graduate of Bangor (Maine) Theological Seminary with a Master of Divinity degree, ordained and non-denominational. I am a clinically trained hospital chaplain. My religious experiences have been varied...sometimes painful, sometimes joyous. I don't really fit in any specific religious "box" and won't attempt to fit you into one either. I am fully recognized in the State of North Carolina to perform marriage ceremonies. Where are you located? I am located in Jacksonville, North Carolina; however, I will travel to other areas with a mileage fee for distances over 50 miles. This all sounds wonderful. What's the next step? You can either call me at 910-795-3655 or e-mail me. Whichever you choose to do, I do ask that you follow up with an e-mail giving me all the information about your wedding ceremony, i.e. your name, the grooms name, the date/time/place of the ceremony so that I have it all in writing and there is no confusion. I will return your e-mail within twenty-four (24) hours whenever possible. If I have the date available, we can set up a time to meet to discuss how I can help you to have a ceremony that will celebrate the two of you and your amazing love.